How about that, it only seems 5 minutes ago that Pokerfest was new, and now the qualifiers are open for the 3rd running of this online poker event - and the prize pool is bigger than ever at $4 million guaranteed across the 64 events. If you have not yet experienced the crazy tournaments at Party then this is a great reason to get stuck in, this site continue to attract many first time players with their big brand name - which keeps the games nice and easy compared to their rival sites. There are a few different aspects of this online event to tell you about – first the setup, dates and schedule. Then the extra incentives which include jackpot prizes for cashing in more than one, and finally how to win seats in the higher buy-in events if your bankroll will not stretch that far. You can check out Party Poker for the full details via my links (using bonus code SNGPLANET for your welcome bonus!) at any time. On second thoughts the schedule takes up around 2 screens! Instead of reproducing the whole thing I will show you the format below and link this to the Party Poker website – you will see the Pokerfest Online banner smack in the middle of the main page, then a big red button which will take you to the schedule! Daily Prize Cards: Earn just one Party Point per day and you'll get a prize card which could contain an entry into one of the PokerFest tournaments.... This is similar to the Party Daily Deal promo which gives cards away. What I like about these kind of deals is that those Party Points can be accumulated and used to buy bonuses later... and while you are clearing that bonus, you'll be earning yet more Party Points! SuperSatellites: How about a $10k guaranteed satellite, one that you can win a seat in itself - this will give a lot of smaller bankroll players the opportunity to get into the bigger events. 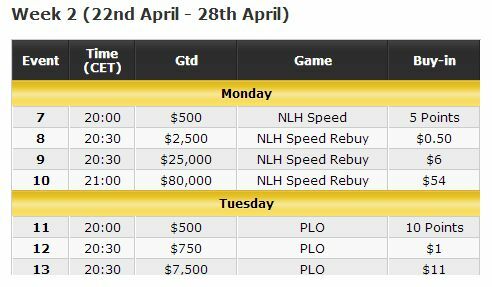 Depositor Freeroll: If you deposit with the code POKERFEST you'll get free entry into the $10k satellite. This is for existing customers as well as new depositors. There are 6 bigger buy-in events with satellite qualifiers, each has a slightly different qualifiying structure – though the same idea runs throughout. You start with a $3 or less daily qualifier, then move on to a $11 to $33 (with or without rebuys) daily main event qualifier… these then get you a ticket to the big event. Note that the $640 event have one more level of satellite. I like the sound of this event – head on over to Party Poker now and get yourself involved in some of the most profitable tournaments online! Remember bonus code SNGPLANET to claim your 100% matched welcome bonus!